Here’s the official press release for the panel I will be on at the upcoming San Diego Comic Con this Saturday. I’m very fortunate to be in some great company. I’m super psyched to meet Del The Funky Homosapien. I’ve been a fan of his work for years and I can remember buying his first CD like it was yesterday. If you’re going to be at the con on Saturday I hope you will come check out our panel and say hello. I will also be shooting a video on Friday and Saturday for my song “Super Secret Identity”. I am looking to feature all cosplayers in the video, dancing and having fun in superhero/villain themed costumes. So if you are into cosplay and will be at the con shoot me a line for more details. 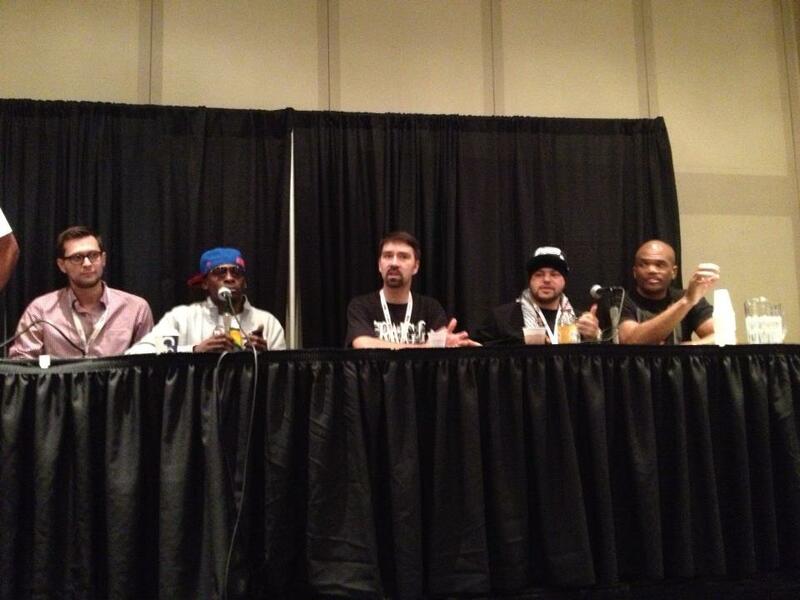 Kagan McLeod, Pete Rock, little old me, DJ Johnny Juice and DMC at a previous panel in NYC. “Hip-Hop And Comics: Cultures Combining” panel presentation at Comic-Con International: San Diego on July 20th at 7pm. On Saturday, July 20th, from 7:00 to 8:00pm, Depth Of Field Magazine is proud to present Hip-Hop And Comics: Cultures Combining, a panel discussion at Comic-Con International: San Diego. Comic books and Hip-Hop grew from modest origins to achieve global impact, and in the process, they have crossed over in innumerable ways – mixing elements of different media to create, innovate, and affect the entire face of modern pop culture. This panel features an incredible line-up of comic creators and Hip-Hop legends shedding light on the ways Hip-Hop and comics have inspired each other, giving historical perspective on common elements and influences, and showcasing new and upcoming projects. The panel runs one hour, and will take place in room 25ABC of the San Diego Convention Center. Comic-Con International: San Diego runs July 18-21, and more information about the convention can be found on their website (http://www.comic-con.org/cci). For updates or inquires on the Hip-Hop And Comics panel, please check www.depthoffieldmagazine.com or @depthzine on Twitter.